The entire corpus of Quilter�s piano music (with the exception of piano reductions of his theatre music and the English Dances opus 11) is contained on this disc � occupying only a few minutes above half an hour. There�s an old Scots saying "guid gear gangs intae little buik". And in these all too brief moments is distilled the essence of a kind of �art� music that has its true inspirational origins not specifically in music but rather in literature (especially poetry) and in painting (1). Apart from the first three studies, which could be said to embody technical/educational elements though using a romantic idiom - would that other books of �studies� yielded such pleasure! - the remaining titles are subtly-coloured mood pictures. A glance at the catalogue of British piano music of the early 20th Century will reveal numerous pieces of similar import � yet there is no arguing against the quasi-aristocratic essence of the Quilter pieces when compared with many of the short piano pieces by British composers of the period. So much of this material was destined, though not necessarily designed for, the schoolroom. A note on the sleeve (by the pianist,) states that Quilter�s piano music "is virtually unknown" Yet the vogue of his songs and the piano scores that continue to surface in boxes in dark corners of secondhand bookshops might suggest that, at least among musically literate amateur pianists, these pieces, like those of Grieg, MacDowell and Chaminade � while not the stuff of conventional concert programmes � were perhaps more widely known than might be thought. At all events Quilter wrote with great understanding of the amateur executant�s limitations � as do his song accompaniments lying neatly under the hand. The pieces are rich in associations with the sister arts � cultured in their allusions � from the evocative Keatsian "Summer Evening" and the Brangwynesque "In a Gondola" to the simple Grieg-like melodies of "Shepherd Song" and "Forest Lullaby". Quilter - with Norman O�Neill, Percy Grainger, Cyril Scott, and Balfour Gardiner � was a pupil of the Conservatoire of Frankfurt-am-Main. The �Frankfurt Gang�, as those loosely associated figures were facetiously known, have been treated in most surveys of British twentieth century musical history with a degree of disdain � even contempt. This is in some measure due to their shared and unconventional detestation of the accepted Conservatoire classics. Gardiner was heard to refer to Beethoven as "that desolating old monkey". Cyril Scott led the way in extreme chromaticism and esoteric interests; Elgar questioned about modernism in music commented "Ah, but you must remember it was Cyril Scott who started all that". Grainger amused with his �naïve idiosyncrasies�. Balfour Gardiner lost patience with composition, despite the fact that he wrote one of the loveliest pieces in English music, his setting of "Philomela" of Matthew Arnold. Their joint and varied contribution to the British musical renaissance in the very early 20th Century has had too little recognition and would bear a cultural and musical reassessment. 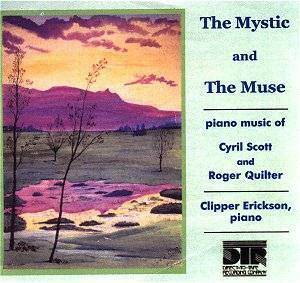 Erickson continues his exploration with Cyril Scott. Selecting two pieces as illustrative of Scott�s originality � Carillon, with its Grieg-like sonorities and Rainbow Trout, an impressionistic piece of quasi-Japonisme with undoubted links to Poissons d�Or and Debussy (whose well meaning testimonial to Scott led to his being pigeonholed as �the English Debussy�). If anything is to banish that unfortunate sobriquet it is the larger-scale works which on this disc are represented by the second of Scott�s three piano sonatas astonishingly recorded here for the first time. This broad single movement is a powerfully mystical work, acknowledging its Listzian progenitor � not only in the organic form, but in the echo of the four note motif which runs through it like a thread; no � too weak a simile - like a chain through the constantly shifting rippling skeins of colourful quasi-glissandi. Grand opening gestures are followed by a Scriabinesque tapestry which undoubtedly, in its incantatory offertory, echoes Scott�s deep interest in theosophical matters. For myself I think the first of the Sonatas (opus 66 � before he tinkered with amendments) is a better and richer canvas. However all three (the third is printed in British Music Society Journal Vol 3 1981) are major works in the canon of British Music of the time. All ought to be on disc. The make-weight here of his children�s pieces encapsulating animal characters - a kind of musical ABC � is clever and amusing. The space here, almost three minutes, could have been better occupied by one or more of his very strange and advanced short pieces. The playing by this enterprising pianist, a pupil of John Ogdon in Indiana, is authoritative, with no lapses into lush sentiment even in the lighter Quilter. It is a delightful recording and I trust in time that the other Sonatas will follow.